Inspiration is a wonderful thing. I just wish I knew how to make it happen more often. As I was walking home tonight, I was pondering an idea I had for the novel I’m planning. I’d been struggling with one very crucial part of the entire setup of the book and how I’d go about it. I realised I was thinking about implementing the idea the wrong way. My modified idea is a bit more down to earth, quite literally. Not only that, it provided me with a short story idea I can use to help introduce my science fiction world. I’ve also had some other inspiration recently that I’d like to get started on soon. I’m going to write some very short stories based on dreams I’ve had. These are some rather unusual dreams, but I felt that they could make good short stories or even flash fiction. When I have time, I’ll be working on them and posting them to this blog. They’ll be more of a writing exercise than something I want to publish. Inspiration has been coming to me slowly lately, mostly due to the fact that I’ve been working a lot with not much free time. I only have one day off every week. But I find that my inspiration comes to me at two very different times. One is while I’m walking home from the train station, and the other is when I’m taking a shower. When do you get inspiration? 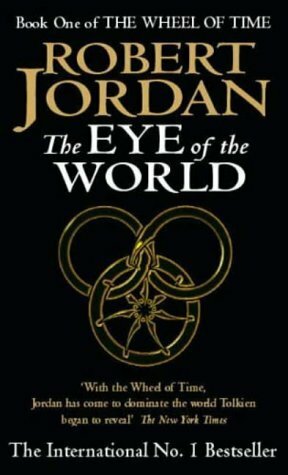 “The Eye of the World” is the first book in Robert Jordan’s fantasy epic “The Wheel of Time.” It’s sometimes considered a modern take on Tolkien’s world, although I haven’t seen any dwarves or elves. I can see some parallels plot-wise, but I’d like to consider this book on its own merits. I don’t like comparing to other books. This series came highly recommended to me by a friend who loves “The Wheel of Time.” I’d already had most of the series, though I hadn’t read any of it. Well, I finally started it, and I’d have to say my initial reaction wasn’t very favourable. I’ll get to that in a moment. The story starts out with a prologue, which sets a bit of a background for the events that will happen in the book. It then moved forward to our main story, featuring a trio of sheepherders, tall and strong Rand, prankster Mat, and stocky Perrin. These three, as well as a few other characters meet a mysterious woman and man, and are swept into a long journey of self-discovery and a quest to save the world from an evil being. Sounds like a pretty typical fantasy epic storyline. It is a pretty standard story, but from what I’ve heard, the books after this are quite different. It’s said in this book that time repeats itself. Ages come and go in a forward progression of time, but the events that happen are repeated many times, though by different people who are actually incarnations of people in previous ages. It’s an interesting concept, so I wasn’t exactly sure if each book would just repeat the same kind of story or not. As far as I know, that’s not the case. It’s a very, very long epic story involving the same characters. I’m interested to see how it progresses. As I said before, my initial reaction wasn’t very favourable. The story progressed very slowly, and I found it somewhat difficult to get into it. The characters weren’t very engaging, and I just couldn’t get attached to any of them. I felt no sympathy for them. But they did grow on me over time. This is the kind of story that you just have to stick with to the end to be satisfied. In the last quarter of the book, relationships between characters were moving in interesting ways, and questions were finally being answered. There were a lot of mysteries presented earlier on in the book, and I was looking forward to seeing them resolved. However, by the end of the book, several mysteries were still unresolved. It ended with the main story concluded, but it also opened the way for a much bigger story to be told. It looks like it’ll be a very large epic story to come. I felt like this book was a mediocre story most of the way, and I was thinking I’d have to give it a middle of the road 3 stars. But the final quarter of the book redeemed it. I’ll give it 4 out of 5 stars. It’s good if you’re patient, and I do recommend that you finish reading it. As many people know, I have a degree in physics and astronomy, so I love to read about space and the planets. When I found “The Grand Tour: A Traveler’s Guide to the Solar System” in a bookstore here in Japan, I knew I had to buy it. This is the third edition, published in 2005. It was written by and contains artwork by artist and author Ron Miller and artist, author and astronomer William K. Hartmann. 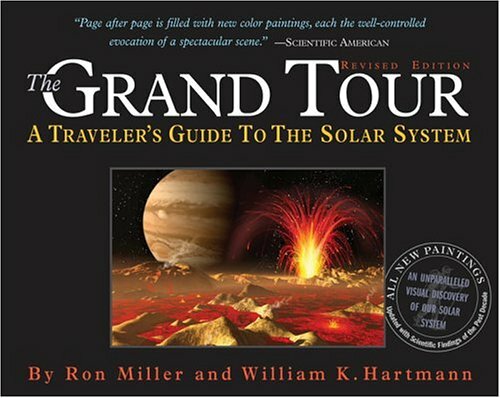 This book is set up to take you on a tour of the solar system as if you are a first time visitor. It starts out with an overview of the solar system and describes how the book is laid out. Then it describes how the solar system came to be. It is a bit scientific here, but reasonably easy to read. The meat of the book comes next. Instead of going through the planets in order, it starts off with the largest bodies in the solar system. Beginning with Jupiter, we get to learn about each body, from the structures to the atmospheres. It moves on to Saturn, then Uranus, Neptune, and finally the Earth. After the Earth, it continues with Venus, Mars and then Ganymede. Ganymede? Yes, Jupiter’s largest moon is larger than the planet Mercury. But Mercury isn’t next, it’s Titan. Then it’s finally Mercury. So basically, it continues on looking at the planets, satellites, dwarf planets, a few major asteroids, Kuiper Belt objects and comets. Each is accompanied by the latest photographs and beautiful artwork. It even contains photographs from Cassini and Huygens from Saturn and Titan, as well as the Spirit and Opportunity rovers on Mars. It doesn’t include any photos from MESSENGER at Mercury, Phoenix at Mars, or Dawn at Vesta. Those missions occurred after this book was published. The book concludes with a section on Exoplanets and a glossary of terms. I really enjoyed reading this book and seeing the artwork. It’s a must for anyone who loves astronomy and planetary exploration. I look forward to the fourth edition, if there is one, with pictures from Vesta, Ceres, Pluto, Mercury, and more! I’ll give this a well deserved 5 out of 5 stars. Highly recommended! Hello everyone! It may be obvious that you can follow this blog via email or if you have WordPress, you can also follow this blog by looking at the right side column at the top. But there are two other ways you can follow me. First is through my Twitter account. I talk a lot about things happening in Japan, as well as blog updates. The other is through my Facebook page. I use that for blog updates only. So, what are you waiting for? If you’d like to make a donation to aid the victims of the March 11 earthquake and tsunami, please visit the Japanese Red Cross Society website, where you can donate via Paypal or bank transfer (watch out for the fees, though!) or the American Red Cross Society, which accepts donations directed to its Japan Earthquake and Pacific Tsunami fund (but only accepts donations made with U.S.-issued credit cards). And of course, if you like the book, please tell your friends, and tell them to give generously as well! Thank you! Japan really does appreciate your help! 2:46: Aftershocks: Stories from the Japan Earthquake is kind of special to me. On March 11, 2011, I went through what many of the people who contributed to this book went through. I live in Japan, and on that day, so many things changed when the magnitude 9.0 megathrust earthquake hit the Tohoku region of Japan, off the coast of Miyagi Prefecture. The devastating tsunami came along afterwards, and then a nuclear meltdown at a nuclear power plant in Fukushima made things even worse. What I read in this book is very similar to my own experiences, and it brought back many memories. The editor of 2:46, Our Man In Abiko, put together a collection of personal accounts by many social media users and bloggers, as well as some famous people, in just over a week. That is quite the feat. This book was created to raise money for charity to help relieve the situation in the disaster-stricken Tohoku region. Some contributors include William Gibson, Yoko Ono, Baye McNeil, Jake Adelstein, and many others. I had an opportunity to participate, but didn’t really think about it at that moment. So, how is the book? Don’t expect it to be well written by every contributor. These are average people who are amateur writers at best, though there are a few professionals who write extremely well. The experiences are wide and varied, from people living near the disaster area to those who are living overseas. But they all have a connection to Japan, most having lived there. Some contributions conveyed emotions quite well. I found that I could relate to most of the pieces, and could clearly picture what was going on. I could feel the motion of the earthquake as I read it. I could see how people reacted in my mind. I lived it all over again several times through this book. Don’t expect amazing narrative or prose when reading this, but please read it to see what it was like to experience a 9.0 magnitude megathrust earthquake and the resulting tsunami and nuclear disaster. Highly recommended! Life with a baby can make it difficult to find time for everything. Thankfully, my daughter is sleeping right now, so I can type this. My wife is starting a new part time job, which will leave me to take care of the baby in the mornings before I go to work, as well as weekend evenings after I get home from work. With luck, she’ll be sleeping or sitting quietly while I try do some things. My other two blogs more or less have a weekly schedule for updates. Jay Dee in Japan has a weekly iPhone photo series. Foreign Dad in Japan is constantly being updated with baby development news and information. This blog has the oneword.com writing challenge. I haven’t been doing very well with it because I get sidetracked with the baby or I’m too tired at night to work on it. Well, I’m going to start writing more for this blog starting now. What I’m going to do is go to bed earlier so I can wake up earlier. This should give me more time in the morning, as the baby often sleeps in the morning, but not so much in the late evening. I will also try to get 30-60 minutes of reading in every night. I’ve been reading so slowly lately because I’ve been so disorganised. Hopefully, this will improve. It better improve, because many of the upcoming books I have to read are quite long. Well, I better get to work on it! Yes, there’s a question mark there, but I think I’ll fill that one with a classic. There are some big books above, but I’m going through a big one right now. At the same time, I have an ebook or non-fiction book going, so these aren’t all I’m reading.